The Story Museum in Oxford takes on a new lease of life. Last week I took my un-literary medic daughter and her friend for a tour of the Story Museum in Oxford. 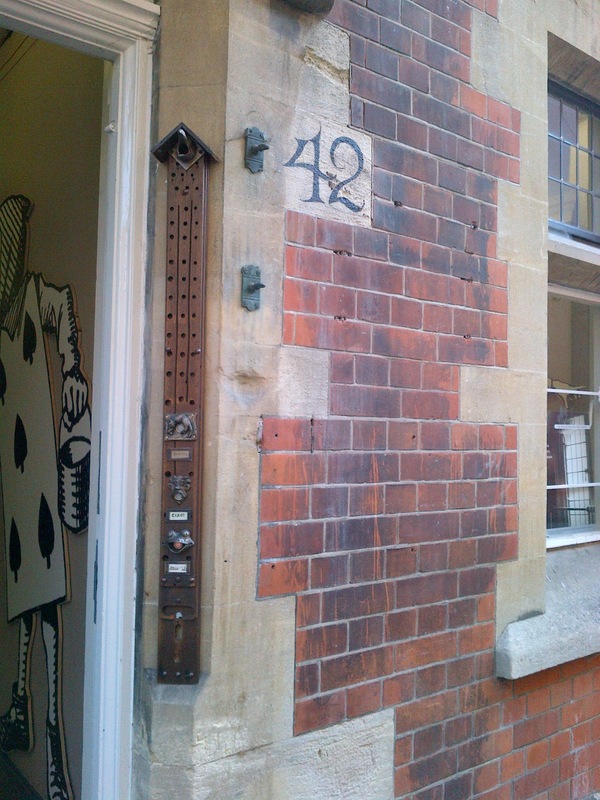 We arrived in true la-la fashion – in the maze of Oxford I couldn’t actually remember where Pembroke Street was, though I knew what it looked like – and after admiring the doorbells (see above), the work of resident artist Ted Dewan, we entered the magic kingdom of fiction, make-believe and all things creative. It’s not that my daughter doesn’t read, she reads a lot, but her taste runs mostly to medical text books – she also has a medics’ anatomy colouring-in book, but that’s another story. She looks at me as if I’m a little odd when I rhapsodise about fiction. I suppose we need doctors as well as writers. The Story Museum has found a home in Rochester House, supposedly built on the site of an inn frequented by Samuel Johnson when he was at Pembroke College (you can tell the stories here are going to run and run). It has served as Master’s lodgings and a Royal Mail, for which read GPO if you’re as old or older than I am, sorting office. Behind the main front door is another front door, with a sliding hatch and a circular counter, ideal for popping a head out of, if anyone felt so inclined. Everything about the house is “Just right” as Golidlocks might have said. There are stairs winding endlessly up to proper untouched writers’ garrets in the top of the house, creaky floorboards, wacky blackboards and odd signs on doors – which writer in residence Michael Rosen is keen to keep. “Only dragons are allowed to smoke in the courtyard” proclaims one notice as we step into the world beyond the main Victorian building to a series of 1930s warehouse-like offices and rooms which flank all sides. One can feel (if one’s not a medic) oneself being pulled into the world of make-believe as posters and card-board cut-outs from the city’s last Alice Day stare out of windows. “Who or what made the huge holes in the walls?” I ask Cath Nightingale, the museum’s press officer, imagining giant masonry-eating rodents still living in the corridors and roof spaces. The answer is much less poetic. Before taking on the lease, the Story Museum had to be sure the building wasn’t about to fall down and it’s structural engineers’ tests of the steel within the walls that have rendered the plaster and brickwork somewhat patchy here and there. A very generous anonymous donor put up the £2.5 million necessary to buy a 130-year lease from Merton College and suddenly, along with a vast quantity of pigeon guano, a set of keys that would have impressed a Victorian chatelaine was handed over. Other effects have been found in the building and put to good use by avid collector, inventor and artist Ted Dewan, who has set up a workshop full of the kind of things you’d forgotten existed. A programme of clean-ups and running repairs has been started to restore the buildings to some kind of new life after the years of neglect and decay. Some parts remain appropriately spooky, others, cosy, warm and inviting. Some have an airy spaciousness, others have a dark intimacy. The Bodleian Library’s presses have found a home here, and print workshops are already being run on site. The Creation Theatre is using the space for rehearsals, prior to its next season. With little twists of creativity and running commentaries from visiting writers present at every turn, the building is not only a receptacle of fiction but a giver of stories and ideas to its visitors. If it inspires a new generation of authors to rival Philip Pullman, JRR Tolkien, CS Lewis and Lewis Carroll the money spent on the building will be an investment. If it offers children a run of imagination and riot of fancy in a world populated by exams, hoops to jump through and prescribed teaching, who cares whether they go on to be writers or doctors? As long as they let their parents accompany them, everyone will gain. Sandra Kessell Create a free website or blog at WordPress.com.